B.Z.S. Racing Parts is a company which is active for over 30 years and which finds its origin in the motorsport. In the early years B.Z.S. Racing Parts was mainly active as tuning specialist for MX-bikes but later on, due to our specific knowledge of metallurgy, the company started to be a specialist as supplier to wholesalers of mopeds with products like chrome swingarms for the, at that moment, very popular Honda MT/MB and also swingarms for the Puch Maxi and Tomos. Furthermore, several accessories for the also popular Citta Gilera moped were produced. Frame construction is currently the most important activity of B.Z.S. Racing Parts. We also make road racing frames and frames for classic motorcycles. The knowledge gained of the material and the motorsport resulted in 2009 in the start of the production of frames for motocross by B.Z.S. Racing Parts . The first frames were higher frames for the Honda CRF 150 which were specially produced for and commissioned by V.H.S. Motoren in Geldrop, The Netherlands. The frames are made of high quality chromium-molybdenum steel and welded in a professional manner. For further information on the frame construction, please have a look under the frame brand of your choice at the menu on the top of the website. From 1995 onwards B.Z.S. 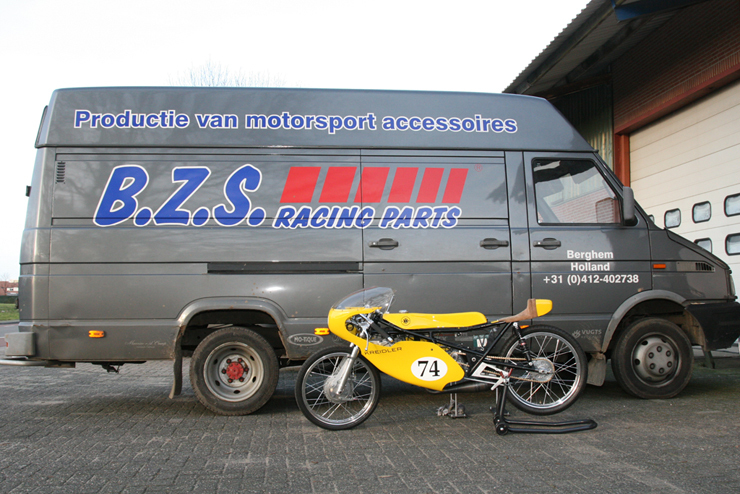 Racing Parts started to produce accessories for custom bikes for wholesalers and importers of motorbikes. One of the biggest customers of that time, a supplier of leather bags and chrome accessories for custom bikes, is still customer of B.Z.S. Racing Parts. During the same period B.Z.S. Racing Parts started also to produce go-cart accessories and later on many products for quad racing were added, amongst others aluminium nerfbars, bumpers and grab-bars. Those products were and are mainly sold under the “Goldspeed” brand. We also have an extensive range of machinery which allows us to do most of the production within our own company.We are also able to carry out various activities (ball polishing and glass bead) for third parties.